Mojicones or piñitas, which is another common name they use in certain areas of Colombia, are delicious sweet bread rolls that are covered with granulated sugar and that you can easily find in many Colombian bakeries. It’s hard to think of a bakery that doesn’t sell them because they are extremely popular, especially when served as snacks during “el algo” or “las onces”, with a nice cup of hot chocolate, or in my sister’s case, a cold soda after school. I think I already mentioned before that making bread is one of the easiest things you can make in your kitchen, even though some people avoid it like the plague thinking it’s harder than it really is. To make spectacular bread rolls I highly recommend working with good yeast, I always use active dry because I can easily store it in the fridge and have it always available. 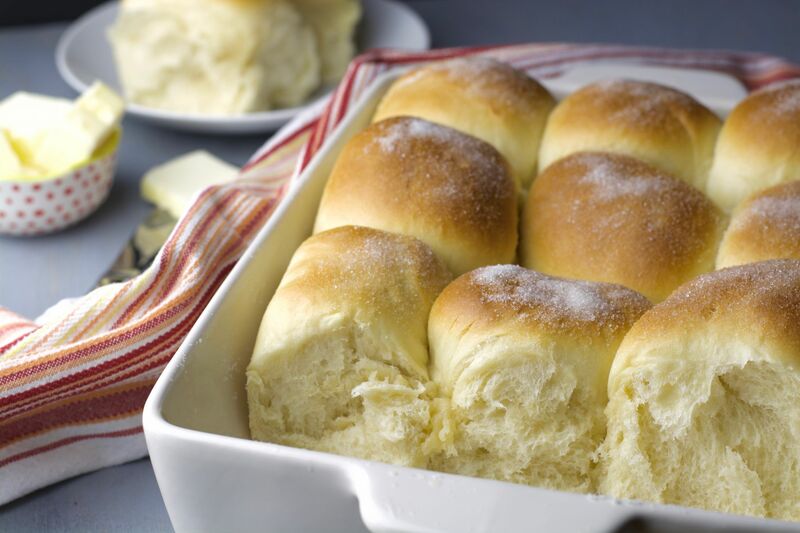 I also recommend that you use bread flour, I’m not saying that regular all purpose flour will not work because it does, but if you want super soft and really, really fluffy bread rolls, the best thing is to use bread flour because of its high protein content. This recipe is very similar to the coconut bread rolls recipe I shared with you guys over a year ago, the difference is that that recipe is made with coconut milk and coconut extract and I make these mojicones with regular milk and vanilla extract, even though some times, like in the video, I don’t add the vanilla. What I never skip is the white granulated sugar I sprinkle on top, which is practically what makes these bread rolls so special and one of the reasons why they are so loved in Colombia. Using a Standing Mixer: Mix milk, dry yeast and ¼ tsp of white sugar in a small container and let it stand for about 5-8 minutes or until a foam forms on top indicating that the yeast is activated. Add one large egg, melted butter and vanilla extract (if using) and stir. Add the egg and yeast mixture. Start mixing with the mixer's dough hook at low speed, then increase to medium speed and let it work the dough for about 8- 10 minutes or until the dough is smooth and elastic. Process continues in step 8 below. Add the egg and yeast mixture. Stir with a wooden spoon or spatula until the dough pulls away from the sides of the bowl. Place the dough on a flat, floured surface and knead with the palm of your hand for about 8-10 minutes or until the dough is smooth and elastic. To knead the dough, fold it over and push down with the heel of your hand. Repeat this process during the entire kneading time. Process continues in step 8 below. Shape dough into a ball and place it in the greased bowl. Cover with plastic wrap and let it rise in a warm place for about 1-1½ hour. Tip: You can turn on a microwave for about 1 minute to warm it up and then place the dough inside. This will help it rise better. Place the dough on a flat surface and loosely shape it into a circle to cut it in half. Shape each half into a log and cut it into 6 equal pieces. You will end up with a total of 12 pieces. Flatten each small piece into a disc and then pull the edges towards the center to form a small ball. Pinch the ends well to seal it, turn it over and finish rounding it up on the counter. Place all 12 balls, seam side down in a 9x13 inch (23x33 cm) greased baking pan. Cover loosely with plastic wrap and let the rolls rise in a warm place for about 45 minutes. Tip: You can use the microwave method to help them rise. Bake in a pre-heated oven at 350ºF (180ºC) for about 20-25 minutes or until golden brown. Take them out of the oven and let them cool for a few minutes. Brush with the melted butter on top and sprinkle with the granulated sugar before serving.